¡NO HABLA ESPAÑOL! 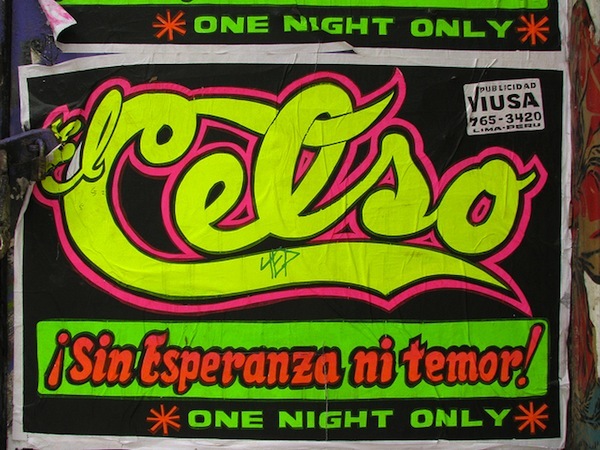 is El Celso’s most personal show to date. This new series of works was inspired by a recent trip to Peru where the artist became obsessed with posters made in the “chicha” style. These hand-made posters line city streets all over Peru and generally feature an eye-popping neon color palette and commercial graphics-inspired lettering. They are generally used to advertise working class concerts and other events. During a recent trip around Peru, in 2010, Celso began collecting discarded and out-of-date fragments of these posters – known as afiches chicha in Spanish – from the streets of towns such as Chachapoyas, Chiclayo, Cajamarca and Lima (to name a few). Further inspired by their look, he established contact with the esteemed Fortunato Urcuhuaranga at Publicidad Viusa, the print workshop that originated this iconic DayGlo look back in the 1980s. (Urcuhuaranga is a former radio DJ and he originally created these posters to advertise his station’s musical happenings.) Based on the outskirts of Lima, in the suburb of San Juan, Ate, this renowned family-run studio has produced posters for countless local Peruvian acts, as well as visual artists and arts organizations around the world. In collaboration with the Urcuhuarangas, Celso created a series of posters inspired by the Peruvian chicha style. However Celso’s posters are a wry play on the idea of the advertisement: event posters created for non-events. Since last year, he has installed dozens of these on the streets of New York and Miami. The project reminds me of Equipo Plastico’s response to Chicha posters – although the gallery show is in a commercial rather than cultural context.